Dr. Judith E. Gallagher-Braun completed her residency in otolaryngology at Pennsylvania State University's Milton S. Hershey Medical Center in Hershey, Pennsylvania. She received her medical degree from The University of Medicine and Dentistry - Robert Wood Johnson Medical School in Piscataway, NJ and her bachelor's degree from LaSalle University in Philadelphia, Pennsylvania. Dr. Gallagher-Braun is board certified from the American Board of Otolaryngology. She is an active member of the American Academy of Otolaryngology. Active in the community she works and resides in, Dr. Gallagher-Braun serves on the Patient Safety Committee at St. Mary Medical Center. She is an active member of the Bucks County Medical Society serving as President in 2003 and on the Board of Directors since 1999, In addition to local service, Dr. Gallagher-Braun serves as a Delegate to the Pennsylvania Medical Society where she is involved in shaping policy and advocacy for the state society. 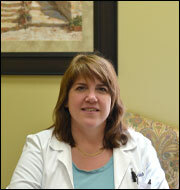 Dr. Gallagher-Braun lives in Bucks County with her three children.